Working together to nurture ambition, academic success and creativity. The school councils across The New Vision Trust have been working together collaboratively on ‘Tackling the litter’. The initial meeting was hosted at Vicarage Primary School where pupils were given the opportunity to meet and get to know one another. At this meeting, they agreed on an area that was relevant to all four schools- reducing litter. A further meeting took place at Nelson Primary School, where pupils worked with the school councils from other schools to share best practice. They took away ideas from what each school was doing to reduce the litter. Some schools went a step further and introduced effective ways to ensure schools were recycling more. 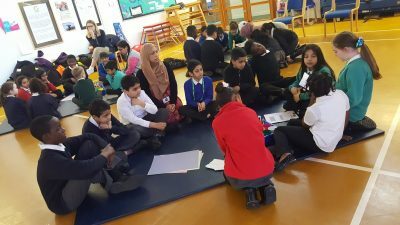 In February, Gallions Primary School hosted a meeting for all the School Councillors from The New Vision Trust where pupils presented their projects. The School Councils received a warm welcome from Mrs Shazia Hussain, the Head Teacher of Gallions Primary School. The meeting began with discussions in groups to share work that the school councils have accomplished so far, identifying challenges and successes. These were in mixed groups- pupils from the four schools. Pupils enjoyed their discussion whilst eating cookies and fruit juice! Afterwards, pupils from each school gave a short presentation on ‘Tackling the Litter’ action, which they had been working on since last year. Pupils used PowerPoint and photographs to present their feedback. During the meeting they also had the chance think about future actions. Mr Shahed Ahmed, CEO of The New Vision Trust congratulated the school councils at the four schools for working collaboratively and highlighted the benefits of working together as a Multi Academy Trust. The school council leads were thanked for their hard work. At the next school council meeting in the summer term at Elmhurst Primary School, pupils will decide on their next joint project.